Pityriasis versicolor, sometimes called tinea versicolor, is a common fungal infection that causes small patches of skin to become scaly and discoloured. The patches may be darker or lighter than your normal skin colour, or may be red, brown or pink. They tend to develop gradually and may join up to form larger patches over time. The areas most often affected by pityriasis versicolor include the back, chest, upper arms, neck and tummy. Although it may look unpleasant and the patches are sometimes itchy, pityriasis versicolor is harmless. You may still want to see your GP, as it usually only improves with treatment. They can normally diagnose pityriasis versicolor by examining your skin. Pityriasis versicolor is caused by a type of yeast called Malassezia. This yeast is found on the skin of more than 90% of adults, where it normally lives without causing any problems. But pityriasis versicolor can develop if this yeast starts to multiply more than usual. It's not clear exactly why this happens in some people and not in others. Pityriasis versicolor isn't related to poor hygiene. The condition can't be spread from person to person because most people already have the Malassezia yeast on their skin. Pityriasis versicolor can be treated with antifungal medicines. These are available as shampoos, creams and tablets. Antifungal shampoos (such as ketoconazole or selenium sulphide shampoo) are often the first treatment recommended for pityriasis versicolor. These are available to buy over the counter from pharmacies, or your GP can prescribe them. In most cases, these shampoos need to be made into a lather and left on the affected areas of skin for 5 to 10 minutes before being rinsed off. This usually needs to be repeated every day for 5 to 7 days. You may experience some skin dryness or irritation when using these shampoos, particularly selenium sulphide. It may be helpful to dilute the shampoo with water before applying it. Some people also find the odour of selenium sulphide shampoo unpleasant. If only small areas of skin are affected, your GP may prescribe an antifungal cream. These creams usually need to be applied to the affected area of skin once or twice a day for several weeks. Some people experience a burning sensation when they use these antifungal creams, but this is uncommon. If a large area of skin is affected or other treatments haven't helped, you may be prescribed antifungal tablets. These usually need to be taken once a day for 1 to 4 weeks. Side effects of these tablets are uncommon, although some people experience problems such as rashes, feeling sick and abdominal (tummy) pain while taking them. Overall, antifungal shampoos, creams and tablets are effective in killing the yeast that causes pityriasis versicolor. But it can take several weeks or months for your skin to return to its normal colour and, in more persistent cases, treatment may need to be repeated. 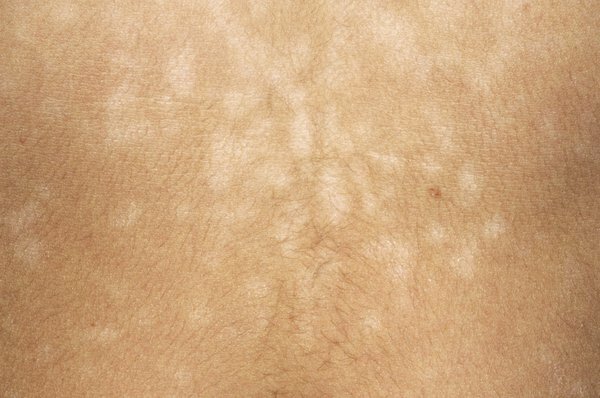 It's common for pityriasis versicolor to come back after treatment, particularly during the summer or during holidays to warm and humid countries. But you can reduce this likelihood by regularly using the antifungal shampoos mentioned above. For example, using the shampoo once a day for a few days before going on holiday can help prevent pityriasis versicolor recurring. As these shampoos are available to buy from pharmacies, you don't need to see your GP for a prescription if you run out. If you develop pityriasis versicolor again after treatment, you can try treating it yourself with antifungal shampoo, or see your GP for advice and alternative treatments. If you have frequent and severe episodes of pityriasis versicolor, your GP may consider prescribing antifungal tablets to take a few times a month to prevent the condition recurring. They may also refer you to a skin specialist called a dermatologist. Pityriasis versicolor can sometimes be confused with vitiligo, as they both cause the skin to become discoloured in patches.